Most any blogger will tell you that Pinterest is one of the best ways to drive traffic to your blog. In our first month blogging, we received over 7,000 page views, with almost 90% coming from Pinterest. We won’t claim to be experts at Pinterest, or any other blogging aspect for that matter. We’ve only been blogging about 6 months, and we know we have lots to learn. However, we’ve learned quite a lot since we began our blogging journey and feel that it wouldn’t be right to keep it all to ourselves. If you can say one thing about us Pingel sisters, it’s that we always are willing to learn more. Knowing how important Pinterest is to our blog traffic, we have researched extensively on the topic. 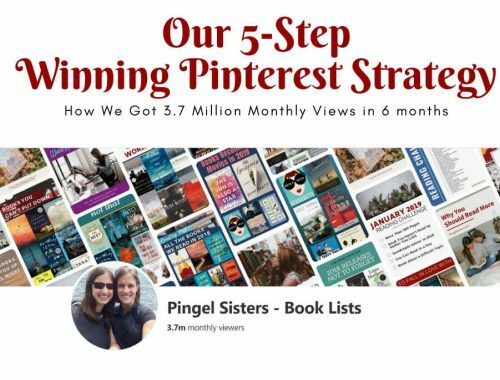 In all our research, one thing we’ve noticed is that many bloggers seem to have a flawed understanding of what Pinterest is and how it can help you achieve your goals. We completely understand that Pinterest can be intimidating. You may even wonder: Where do I start? To help out our fellow blogger who struggle with Pinterest, we’ve decided to run a series of posts on the basic principles to create a new Pinterest account that will skyrocket your Pinterest strategy. Really, why not set up your Pinterest account right the first time? Without further ado, here’s is today’s post on the different types of Pinterest boards. Each serves a different purpose, and by understanding each one, you’ll know who to use it to your advantage. 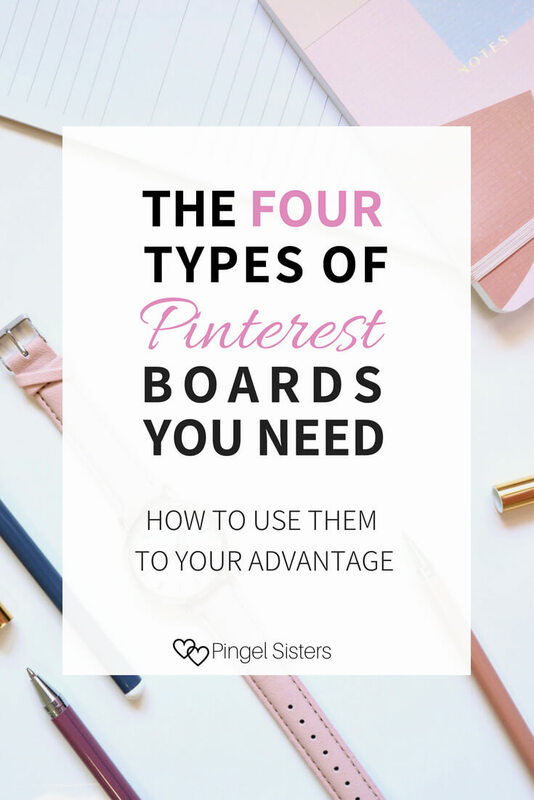 You’ve probably heard of three types of Pinterest boards, but did you know there are actually four? When listing the types of Pinterest boards, first and foremost is the brand boards. Every professional account needs boards solely dedicated to their brand. The whole point of using Pinterest is to draw traffic to your blog (or your affiliate links), so you want to make it easier for anyone who views your profile to find your original content. Start by creating a “Best of” Board. This should be the first thing people see when they visit your profile. You want someone who looks at your profile to have easy access to just your material. Every time you create a new pin, pin it inside this board. Only pin your own content to this board. After awhile, though, this Best of Board will become pretty large. Eventually you will have tons of blog posts, each with multiple pins. To make your profile even easier to navigate, create specific content boards for each of your blogging categories. It helps if you’ve thought out your blog organization in advance. We can’t tell you how many times we’ve visited a Pinterest profile of a blogger and been unable to find their original content. That’s a missed opportunity. After your brand boards, the next one you need of the different types of Pinterest board is topic boards. These boards serve two main purposes. It gives you a place to put pins you save from other people. It gives you more places to put your own pins. As a rule of thumb, we suggest you have at least 3-4 topic boards for every blogging category you have. If you haven’t already made an organizational chart for your blog topics, creating your topics boards is a great way to help you. Start by taking each category and list all the different subcategories you’ll want to write posts about. These subcategories will be your topic boards. Let’s take an example. If one of your topics is Work, sit down and make a list of all the different blog posts you would want to write about. 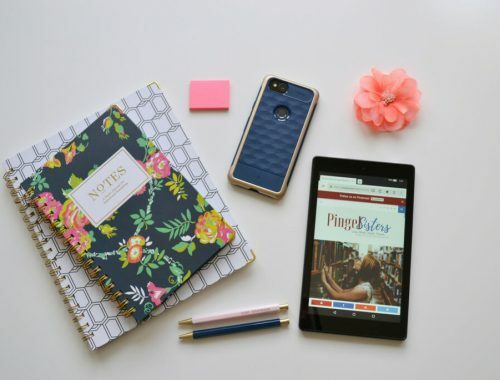 After looking at your list, you might group your types of work posts into the following subcategories: Work Advice, Working Mom Struggles and Blogging Tips. You want your Pinterest account to look professional. That’s why all your boards should be related to topics you write about. You want a place to put your pins, and you want to find pins from other people that are similar to your own topics. We don’t write about makeup or cooking, so we never pin about them. Now whenever we pin on Pinterest, we only save pins related to our brand’s focus. Of all the types of Pinterest boards, group boards are the key to success on Pinterest. Here’s how it works. All the brand boards and topic boards on your profile are solely yours. No one else can pin into them. On the other hand, a group board is just a Pinterest board that has multiple contributors. The aim is that a group of people join together to help promote each others content. You pin your content into the group and then save their content onto your topic boards. It helps your content reach new viewers and then, hopefully, go viral. Remember, you’ll want to observe the standard etiquette of group boards. When you share one of your own pins into a board, you need to make sure it falls into the group board topic. You don’t want to save travel pins onto a Book Club group board. Regardless, if you do save a travel pin into a Book Club group, your just wasting your time. The chances of someone sharing it are slim to none. Also, you’ll want to follow the group board rules. Many ask that for every pin you share, you save a pin from the group board. Every board is different. Some let you share unlimited pins while others limit you to one pin a day. We generally limit ourselves to 3 per day in any one board for the larger boards. On smaller boards, we have even lower limits to make sure we don’t overwhelm the board with our own content. You want to join plenty of group boards. They are the best way to get your content spread. Look for group boards with a decent number of followers within your niche. Beware: if you join too many boards that are too big, your content can get lost in the sea of pins. Finding the right balance takes work, but we have a tip to help you evaluate your group boards. If you’ve ever read any article about Pinterest for bloggers, you’ll have heard of Tailwind. Tailwind is the absolute favorite scheduling app bloggers use for Pinterest. You can set it up your schedule to automatically pin content to Pinterest all day and all night. When we first started, we gawked at spending money on Tailwind. Instead, we sat down and created a spreadsheet to help us develop a manual pinning schedule. Honestly, with the right plan in place, you can have just as much success pinning manually as you can using a scheduler. Our views were up, and we were doing great. Then, Rachael went on vacation to Europe. Suddenly, our perfectly executed plan fell apart. After she got back, we decided our first investment would be Tailwind. Having an automated scheduler suddenly freed up a ton of our time. 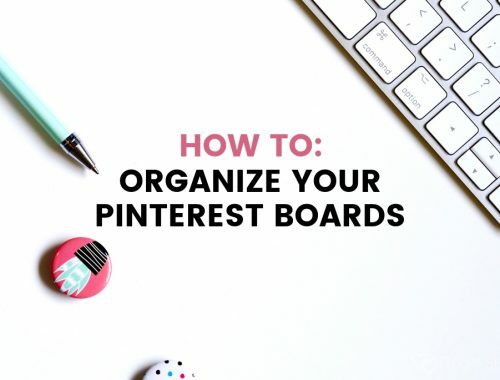 Instead of being on Pinterest for up to an hour every day, we could spend an hour a week scheduling our pins, and just a little bit of time each day pinning other people’s content (which is the fun part of Pinterest anyways). Now, we don’t have to worry about going on vacation, or just not feeling like getting on Pinterest that day. While the automated scheduler is nice, Tailwind’s other features surprised us even more. One of the handiest tools included with Tailwind is their analytics. If you have a business account on Pinterest (which you should) you can some analytics about your account. Unfortunately, on Pinterest, you can only see your most successful boards and pins. On the other hand, Tailwind gives you way more insights into not only your most successful boards but also your least successful boards. With the Board Insights, you can filter down through your regular boards, group boards and your secret boards. A table will show you how many pins, followers and repins each board has. However, the true beauty is that Tailwind shows you a virality score (how many repins per pins) and an engagement score (how many repins per number of pins and followers). With these statistics, you can start to see which boards are helping you reach your goals and which boards are dragging you down. Looking at my board insights, I saw that I was in a group board where I had placed over 150 pins into the group, but had only received 3 repins. Obviously, I was just wasting my time with that group. Furthermore, you can select a specific board and switch to Pin Insights – where you can see how each pin you’ve placed in that board is performing. You can’t easily see this on Pinterest. Most of the time, Pinterest Analytics will show you how many repins all instance of a pin have across Pinterest. In contrast, Tailwind can tell you that all your repins are coming from Board X instead of Board Y. With our love of statistics, we love how much information Tailwind gives us … and how easy it is to read. 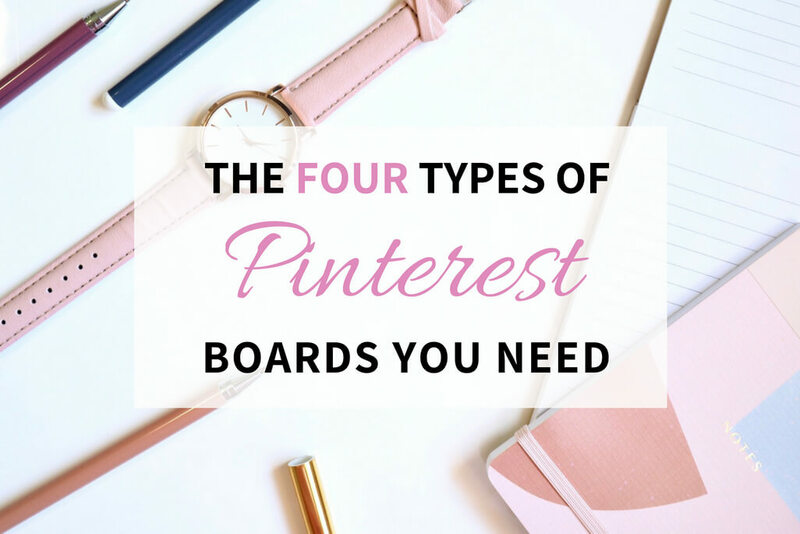 We know we said there were three types of Pinterest boards, but, in reality, there are actually four! Tailwind Tribes are essentially another type of Pinterest group board. Here’s how it works. Included with your subscription to Tailwind, you are allowed to join up to 5 Tailwind Tribes. If you want, you can pay for more, but most people don’t. Since the number of tribes you join is limited (unlike Pinterest group boards), you need to make sure you make the most of them. You want to join tribes that are active, fit your niche, and have a good repin rate. Sounds easy enough. But there is a catch. Not only are you limited in how many tribes you can join but also you are limited to how many pins you can share into the tribe. On the basic plan, you get 30 submission a month to ALL of your tribes. That equates to 6 pins per tribe per month. We know many bloggers pay extra to be able to pin into your tribe more, and maybe one day we will, too. Do Tailwind Tribes really help? Let us but it this way. Every single thing we have placed into a Tailwind tribe has been repinned multiple times. We definitely do not get that when we pin into our group boards (not yet at least). If you’re still unsure, read all about why Tailwind is worth the money and how we used Tailwind to get to 3.7 million monthly views in just 6 months. If you are interested in using Tailwind, use our affiliate link and you can get $15 off when you sign up! Thanks so much for all these tips!! Learning to navigate Pinterest can be daunting. 🙂 I have a question — can you post one Pin to multiple boards? Or do I have to create a unique Pin/photo for each group board (or any board) that I post to? Yes, you want to pin the same image to all relevant boards. Then I like to design a new image and do it all over. You can keep updating and creating pins for your old content for as long as you want. Great advice, i’ve set up everything except the tribes but I guess i just haven’t been spending enough time looking for pins to add to my feed.. I basically have my pinterest boards set up like this except for tailwind, I haven’t gotten around to investing in that. 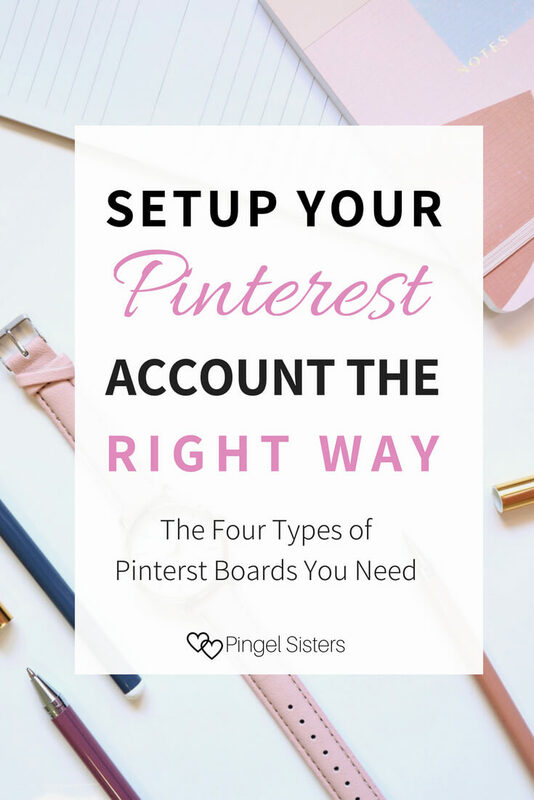 I love all things Pinterest so OBVS enjoyed this post 🙂 Thank you so much for sharing these awesome tips! I was a bit skeptical with Pinterest at first but now I love it. It’s one of the most enjoyable aspects of blogging I think. Thanks for the great information! I use Tailwind but need to use my tribes more. This was so helpful thank you!! Great post!